Location: West of Haines, Alaska, border with BC. Attempted May 7 - May 25, 2011. Did not summit. The small village of Haines in Alaska, is the normal point of departure. You can travel to Haines from Juneau by air or ferry. There are daily flights from Seattle to Juneau. From Haines, one must fly to the glacier below Mount Fairweather. There are two pilots in Haines that offer this service, Paul and Drake. This flight depends on nice weather in the Fairweather area and cost (2011) about 700 dollars round trip. I, From the lower glacier to the upper glacier. 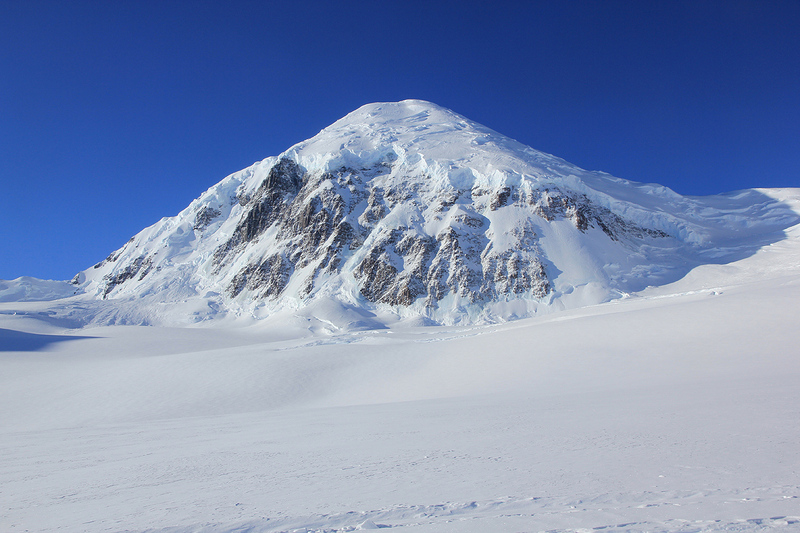 This section climbs from the airplane landing area and up to the Mezzanine, a flat section just before the more distinct glacier heads uphill towards the main col. There are big, lateral crevasses, these may be turned by moving up and around on the right hand side (as seen from below). III, Navigate through a new section with large crevasses, then continue uphill, possibly turning the last crevasse on the right, in order to gain the small, upper basin. This basin may also be subject to avalanches (from three sides!) during extended storm periods. 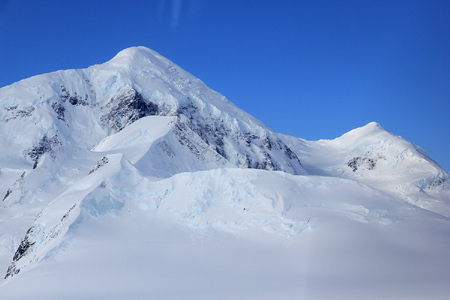 IV, Climb a moderate snow slope and continue more steeply uphill, crossing two big crevasses (need to find snowbridges, these may or may not exist), in order to reach the main col.
V, Turn left, and climb the ridge to the Fairweather summit. May 7., Day 1: I left home at 0500 and arrived at Juneau Hotel (via Amsterdam, Seattle, Kitchican, Sitka) at 1900 local time. That is, exactly 24 hours of travel. May 8., Day 2: Attempted Mount Juneau, brunch in Juneau (beagle place), then shopping. May 9., Day 3: Got to the ferry, met Gerry Roach. Arrived in Haines. May 10., Day 4: Went hiking with Paul and Annie. No weather for flying. May 11., Day 5: Tried to fly in, but Mount Fairweather was in thick clouds. May 12., Day 6: Climbed Mount Ripinsky, still no weather for flying. May 13., Day 7: Tried to fly in, but had to turn around. May 14., Day 8: Finally, we flew in and established Base Camp. Did a carry to ABC. May 15., Day 9: Established Advanced Base Camp on the Mezzanine. May 16., Day 10: Navigated up the icefall and fixed ropes to the very top of the col.
May 17., Day 11: Bad weather, stayed in camp. May 18., Day 12: Bad weather, but did a hike down to Base Camp. May 19., Day 13: Gusty winds, we improved the snow walls. May 20., Day 14: Lots of new snow. We went to practice ice climbing. May 21., Day 15: White out conditions, when do we get improved weather? May 22., Day 16: Better conditions, but a small blizzard from 1200 until 1500. Nice evening. May 23., Day 17: Started out at 0415 for the summit. Hit by a blizzard at 0900. Lost our cache. Turned back. May 24., Day 18: I flew out with Drake, continued to Juneau with Wings of Alaska. May 25., Day 19: Left Juneau at 0800, Seattle then Amsterdam. May 26., Day 20: Arrived in Bergen at 1400. May 29., Day 23: Gerry and Chris made the summit, - finally success! After some advance discussions with Gerry, we had decided that May 25th. could be the last possible day for my return flight. Consequently, and unfortunately, I had many obligations back home starting May 26th. In hindsight, I should have allocated another full week to this trip. Among other things, I had 12 people signed up for a classic skitrip across the Jostedalen glacier, starting on June 1. As things were, I had little choice, but to fly out on May 24th. when the weather that day actually permitted flying. Two other groups came in on May 24, making the summit in only 5 days. They all used the route we had esablished more than two weeks earlier. Mount Fairweather, as seen from the Base Camp area (Airplane landing site).